Happy Birthday to Coney Island’s Cyclone Roller Coaster! We’re going to a birthday party today in Coney Island. The Cyclone Roller Coaster, which gave its first ride on June 26, 1927, is 82 years young. As Gerry Menditto, the operations manager for the coaster told the Daily News, “I’ve been here 34 years, and we’ve probably rebuilt this entire ride while I’ve been here. While most of the steel has been around since the beginning, the wood gets replaced regularly.” This season we started taking photos (like the one above) that highlight the architectural beauty of the National Register-listed New York City landmark. Brothers Jack and Irving Rosenthal commissioned the legendary Vernan Keenan to design, and Harry C. Baker to construct, the preeminent wooden-tracked roller coaster. The design had to be exceptionally tight and steep because of the relatively small ground space that was available for the attraction. The construction of this masterpiece began on a historical site which was significant in the world of roller coasters — the Cyclone graces the place which contained the world’s very first roller coaster, LaMarcus A. Thompson’s Switchback Railway. Thompson’s “Roller Coasting Structure,” the first coaster to be designed as a U.S. amusement ride, opened in June 1884. National Geographic is celebrating the 125th anniversary with pictures of the Switchback Railway, the Cyclone and other notable coasters. Today’s birthday celebration begins at 11 am. On its 82nd birthday the first 100 people in line get to ride the Cyclone for free. The coaster opens at 12 noon but the line is expected to start forming early. Miss Cyclone Angie Pontani will be there to meet, greet, and dance with visitors. From 11 am to 1 pm, the Cranky DJ will spin 78rpm records on his 1923 Brunswick phonograph and 1921 Victor Victrola. “These songs are from a very special time in the history of recorded music<” says the Michael Haar aka The Cranky DJ. Some of the selections that will be played at the Cyclone Roller Coaster’s birthday party are Irving Berlin’s “Alexander’s Ragtime Band” and “Everybody’s Doing It” from 1911 and 1912, “The Sidewalks of New York,” singing sensations Al Jolson and Nora Bayes, and the vocal comedian Billy Murray. The party takes place at the Coney Island History Project’sexhibition center on Surf Ave under the Cyclone. AUG. 28 UPDATE: Due to the ongoing Coney Island redevelopment hoopla, ATZ is getting more than the usual number of queries that ask: Will the Cyclone be open in 2010? The answer is YES, THE CYCLONE WILL BE OPEN IN 2010 and for many years to come. 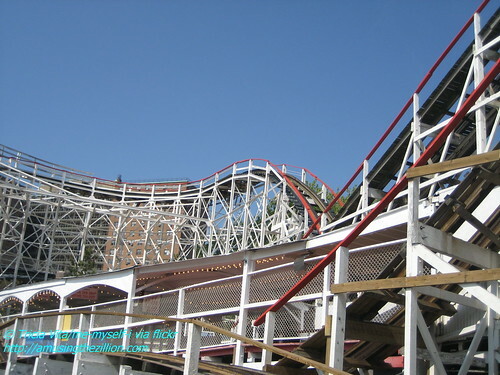 The roller coaster’s designation as an official New York City Landmark by the Landmarks Preservation Commission in 1988 is one of the strongest possible safeguards. The Cyclone is owned by the City, which leases it out to the Albert family (former owners of Astroland Park) to operate. The Cyclone is open daily, noon to closing, until September 7. Then it will be open weekends only through September 27. August 5, 2009: Coney Island Has 56 Rides and 33 More Days of Summer!